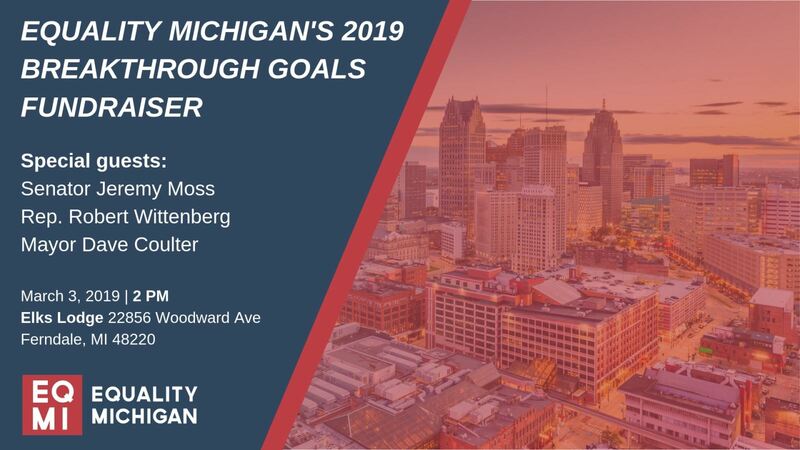 Register now to join Equality Michigan and special guests Senator Jeremy Moss, Representative Robert Wittenberg, and Ferndale Mayor Dave Coulter for a special event to raise much-needed funding for our programs and learn more about our ambitious 2019 break through goals. Equality Michigan educates and advocates to change Michigan laws and address issues that disproportionately impact LGBTQ lives throughout the state. Your financial support ensures we have what we need to best support the victims of injustice. Your contributions also help us to work with and better train the systems and institutions that can help prevent LGBTQ/SGL/HIV+ bias, discrimination, harassment, or violence from happening or provide justice for the victim when it happens. Help us ensure our survivors have what is needed in their fight for dignity and justice by joining us on March 3rd.